From June 4th to 7th the Wilderness Ranger Academy of Region 2 and 3 of the U.S. Forest Service took place in Red River, New Mexico. The participation of Mykola Romaniuk (Carpathian Biosphere Reserve) of our European Wilderness Network and the European Wilderness Society, set the starting point for an exchange programme with the U.S. Forest Service. More rangers of the European Wilderness Network will have the chance to take part in this event next year! What does a Wilderness Ranger in the U.S. do? These tasks are done during regular multi-day trips to the Wilderness. The trainings of the Wilderness Ranger Academy give the rangers the necessary legal and practical background to guarantee for their safety while being out in the Wilderness. Lectures dealt with the history and framework of the U.S. Wilderness Act and the Value and Marketing of Wilderness. The concept of Minimum Requirements Analysis was also discussed. This analysis is supposed to detemine the necessary but minimally impacting activity that is in line with the Wilderness character. The Wilderness character monitoring of the U.S. Forest Service was also a topic covered during the training. Three of the six international guests has the opportunity to shortly present their conservation work and protected areas. These three presentations made it possible to see different approaches to protected area management and offered a great foundation for further discussions. Several training sessions were dedicated to explain and practice public contact. The concept of “Authority of the Resource” formed the basis for this. With this concept rangers try to educate visitors from the perspective of nature rather then the law. Trainings about risk management, Wilderness first aid, teaching Leave No Trace to youth, Orienteering and an introduction to rigging formed the morning of the third day. The day went on with trainings for bear safety, knot tying, axe skills and packing your pack. This intense day ended with a backcountry Wilderness Ranger Cook-Off that also hosted two international dishes. As 2018 marks the 50th anniversary of the Wild and Scenic River Act, an excursion took the participants on an amazing river raft on the Rio Grande River. 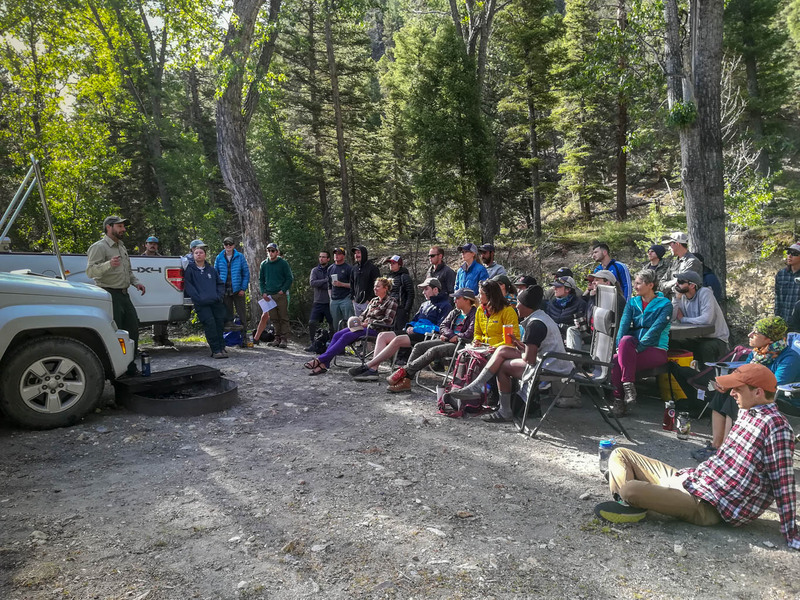 The Wilderness Ranger Academy 2018 ended with a motivating speech by Dave Foreman, a long-time wilderness advocate. After the Ranger Academy, the international guests discussed and worked on their personal and professional action plans. This included the question about what things they can bring back to their countries and organisations. Wilderness and protected areas rangers in Europe have a different profile. In most countries and protected areas their main task is to guide people. Monitoring and education also takes up a big part of their work. However, foresters do most of the trail work. Austrian National Park Rangers, for example, guide excursions and group hikes for children, teenagers and adults. They monitor and collect data about the vegetation and animal population or check if trails or structures need maintainence. These rangers also educate visitors about the appropriate behaviour in the National Park and nature in general. Potential Austrian National Park Ranger have to participte in a 42-day course. This course deals with animal and plant species, geology, climatology and weather, ecology and nature protection, first aid, education and special features of the respecting National Park. The intended outcome of our cooperation with the U.S. Forest Service would be to develop a uniform profile of a European Wilderness Ranger, for our European Wilderness Network.